Although luck is one of the determining factors in the outcome, strategy plays a more important role in the long run. With each roll of the dice, players must choose from numerous options for moving their checkers and anticipate possible counter-moves by the opponent. In variants that originate from early 20th century New York, players may raise the stakes during the game. There is an established repertoire of common tactics and occurrences. 44th Backgammon World Championship 2019 - July 30 - August 4. Hotel Fairmont Monte Carlo, 12 Avenue des Spélugues, MC-98000 Monte-Carlo, Monaco. ABT | American Backgammon Tour - since 1993. "A comprehensive compilation of major international backgammon tournament results posted in a timely manner." USBGF | US Backgammon Federation - since 2009. 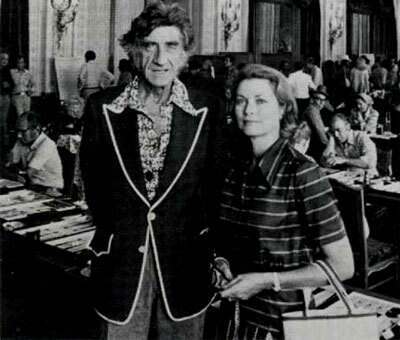 "American Backgammon Tour, U.S., & International Tournaments." World Series of Backgammon - Televised, high stakes backgammon tour founded in 2006 by television producer and backgammon player, Andy Bell. GammOnLine - "Your on-line backgammon magazine." Article Index. GammonVillage Magazine - "The Web's largest and most interactive backgammon portal. GammonVillage first launched in December 1999. There are currently over 45,000 registered users at GammonVillage and we are growing everyday!" PrimeTime Backgammon Magazine - "Backgammon magazine on the USBGF website." Absolute BACKGAMMON App - iTunes App Store. "No ads, no gimmicks, just great backgammon and acey deucey. If you liked Absolute Backgammon and Acey Deucey for the desktop, you will like this version too - same great backgammon." Ariston BACKGAMMON - "Challenging backgammon software for Windows." Backgammon books on Amazon.com - as of March 28, 2019: 927 results. BACKGAMMON for Android - Google Play. BACKGAMMON for beginners - "A tutorial for those starting from scratch . . . and perhaps a refresher for some!" BACKGAMMON for BlackBerry - BlackBerry. BACKGAMMON GALORE! - since 1995. Lots of useful resources. BACKGAMMON on YouTube - as of April 1, 2019. BACKGAMMON Room - "The No. 1 Online Backgammon Software." BACKGAMMON Tutor - "Learn and improve in a fun interactive way!" Best recource for making your game better - Reddit. BG Online - backgammon opening rolls and analyses, and much more. 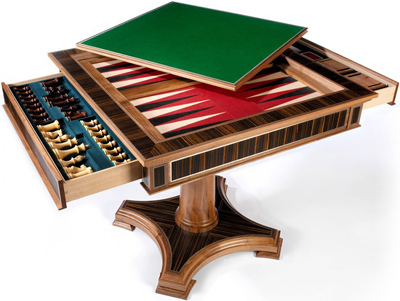 British Isles Backgammon Association (BIBA) - "By backgammon players, for backgammon players. Established 1989, and dedicated to British Backgammon it is the biggest backgammon body in the UK with a worldwide membership." Chicago Point Backgammon Online - "A Prime Source of Backgammon Information." Database of BG Matches - "You can upload and edit data of backgammon matches on this database. You can search and watch backgammon matches and download match files." eXtreme gammon - since 2009. "World Class Backgammon Software for Players of All Levels!" eXtreme Gammon is the strongest and fastest backgammon computer program avaliable. European Backgammon Federation (EUBGF) - since 2013. A non-profit union of national backgammon associations for the continent of Europe, aimed to strengthen the bonds between national backgammon federations to support the development of organized backgammon in Europe. GAMMONED.COM - "Backgammon Guide - Learn Rules, Strategy and More." Online resource committed to providing information all about backgammon. You'll find links to pages throughout our site with useful information to newbie backgammon players as well as those who are more well versed in the game. GAMMONLIFE - "#1 Site of the Worldwide Backgammon Community." iBACKGAMMON App - "Play backgammon against the computer or your friends. 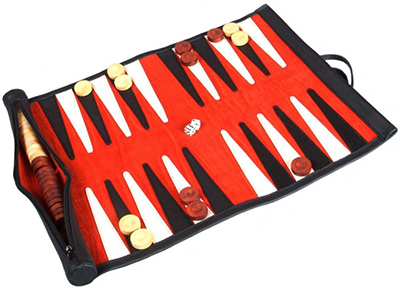 You'll have a lot of fun and you'll see your backgammon game steadily improve!" iTunes App Store. In Jonathan Lethem’s ‘A Gambler’s Anatomy,’ a Hustler’s Luck Turns Cold - The New York Times. International Backgammon Championship - organized by the United States, Japanese, & French Backgammon Federations. 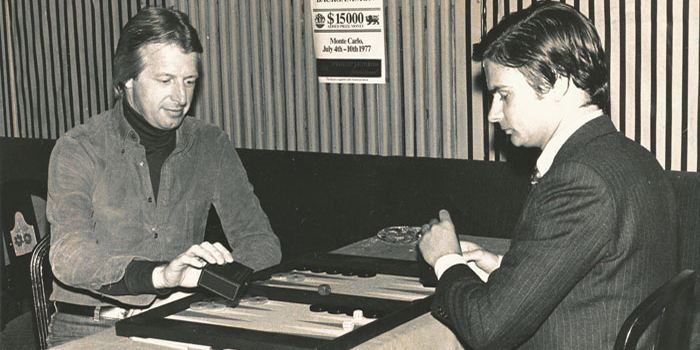 Internet BACKGAMMON Database - "Profiles of tournamenet players." Kit Woolsey's match equity table - "Calculating and Using Match Equities." List of World Backgammon champions - (1967-). Pip Count - by Michael Crane. Prince Alexis Obolensky - (1915-1986). Was a Russian-American socialite and sometimes called the "father of modern backgammon," was a member of the princely Obolensky family of the Rurik Dynasty. Racquet and Tennis Club - private social club and athletic club located at 370 Park Avenue, between East 52nd and 53rd Streets, New York City, New York. The Racquet and Tennis Club also played an important role in the history of backgammon: In 1931 Wheaton Vaughan, who was chairman of the club's Card and Backgammon Committee then, invited representatives of other clubs in New York and elsewhere to formulate the Laws of Backgammon. This set of rules is the basis of the rules according to which backgammon is played around the world today. THE BACKGAMMON PRESS - "The web's best source for backgammon books, videos and lessons." True BACKGAMMON HD App - "One of the most successful Backgammon games on the iPad/iPhone, one of the most powerful computer opponents worldwide, now has gotten even better." United States Backgammon Clubs - Updated: March 26, 2019. USBGF | US Backgammon Federation - since 2009. "Growing Backgammon. Serving Players." A not-for-profit organization devoted to advancing the awareness, participation, education and enjoyment of the skill-based game of backgammon. World Backgammon Association - since 2000. "Leading authority and promoter of backgammon worldwide. Creator of the World Backgammon Tour (WBGT) and the prestigious European Backgammon Tour (EBGT)." 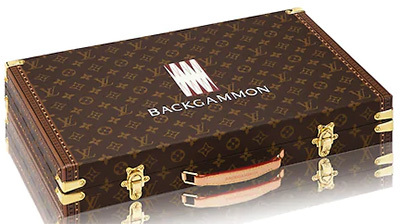 World Backgammon Day - 21st March 2020. "Celebrate the oldest game on the planet and enjoy it with your friends all around the world. Play a few games live or online. Organize meetings and events in your city and neighbourhood. Backgammon groups and clubs should organize special events and tournaments on that day. Spread out the word and let everyone know the date of this worldwide event." Zare BACKGAMMON Race Database - "The Zare Race Database is a program for studying backgammon races. ZRD is designed so that you can set up and evaluate positions quickly, and thus compare multiple positions. Individual positions probably won’t come up again, but understanding a class of positions will help you to play better." Agresti Backgammon Set - case in elm briar & mahogany. ASPINAL OF LONDON - since 2001. Backgammon sets. ASPREY London - "British Luxury Goods Since 1781." English saddle leather backgammon board, with precision dice, counters, dice cups and a doubling cube. 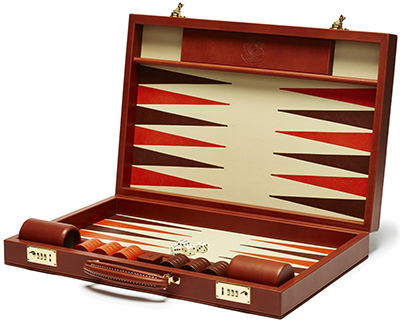 BENTLEY COLLECTION - bespoke Bentley Backgammon board designed by Geoffrey Parker Games: £3,675. BG Shop - "Backgammon and Board Games Shop." Dunhill - since 1893. 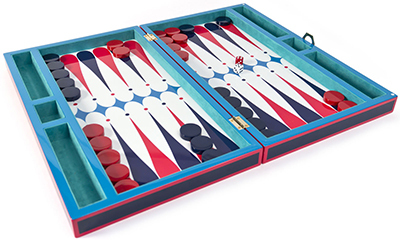 Boston Backgammon Set: £1,795. 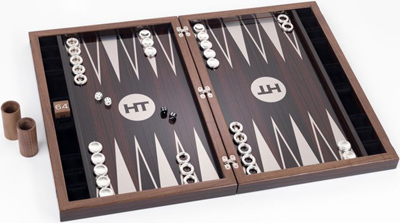 Inspired by dunhill's fine attache cases, this backgammon set is ideal for anyone who is serious about the great game. HENRY TUKE London - since 2011. Ebony and silver backgammon set. Macassar ebony and black walnut board, wafer thin stainless steel inserts under the varnish for a seamless playing surface, with invisible magnetic catches. Shakers and doubling dice in black walnut. Playing dice are precision laser engineered professional backgammon competition dice. Nearly 3kg of tactile sterling silver pieces, hallmarked with our distinctive Tuke and the leopard of London hallmarks. Total weight is about 20kg. Price: £24,950. JONATHAN ADLER - since 1998. 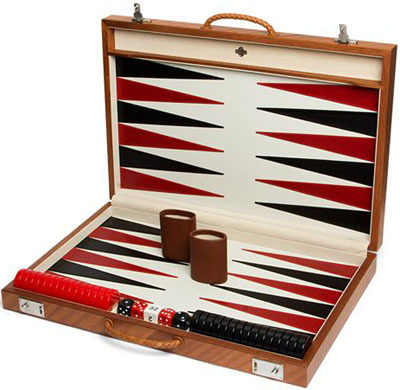 "Our Lacquer Backgammon Set is a fabulous combination of function and groovy design." LINLEY - since 1985. Bespoke backgammon sets. Louis Vuitton - since 1854. "Inspired from the classic Président attaché case, this Backgammon case enables players to carry their games everywhere." Lucrin - founded in Switzerland in 1994. Leather travel backgammon. 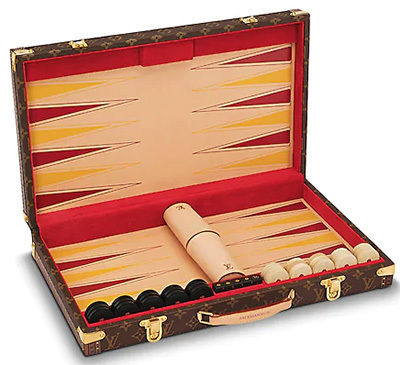 LUZZO BESPOKE - backgammon set. Polished aluminium body with kid glove leather covered Carbon Fibre top and base. Polyester lacquered playing surface with snake skin details counters. PICKETT London - since 1988. "Luxury Leather Game Sets." Handmade in England, these backgammon sets range from travel friendly styles to elegant wooden box frame styles each available in a range of luxurious leathers from British Lowick leather to the more exotic lizard skin. Purdey - since 1814. Leather backgammon set: £4,800. RALPH LAUREN - since 1983. Sutton Backgammon Set. Part of our Sutton collection, this competition-sized travel set is a refined take on the classic game and combines the warmth of walnut with the modern look of carbon fiber–embossed leather. The carrying case doubles as a game board and is finished with custom "RL"-debossed locks for a subtle signature touch. Sage Brown - Backgammon Travel Rolls. WILLIAM & SON London - since 2000. Leather & travel backgammon sets. 24/7 Backgammon - "Play the best Backgammon online for free with no signin required! Play backgammon immediately!" 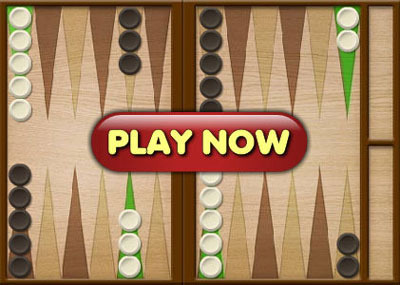 Backgammon - "Play the classic board game Backgammon online for free. No download required. Can you beat the computer?" BACKGAMMONTRIAL.COM - "Free backgammon games and downloads, top payouts and recommended rooms, tips and promos." Best Free Backgammon Software - Gizmo's Freeware. PLAY65 - "The World's Largest Backgammon Community." Online Backgammon Games & Tournaments. VIP Backgammon - "Play backgammon online for free! Win games and move up the leaderboard! Become a part of the global community. Join us Today!"